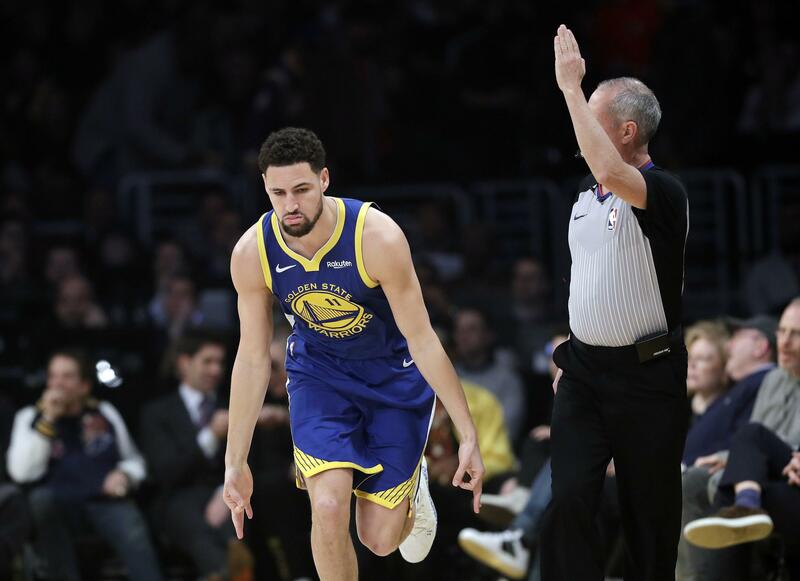 Klay Thompson set an NBA record by making his first 10 attempts from 3-point range, scoring 44 points as the Golden State Warriors beat the short-handed Los Angeles Lakers 130-111 on Monday night in Los Angeles to match a season high with their eighth consecutive victory. Thompson finished 10 of 11 from beyond the arc as the two-time defending champions won their seventh straight road game. The star guard had 23 points in the third quarter, connecting on seven 3s as the Warriors stretched their lead to 36 points. He finally missed from deep late in the period. He sat out the fourth quarter. Kevin Durant added 20 points and Stephen Curry had 11 points and 12 assists, going 2 of 10 from 3-point range for Golden State. Celtics 107, Heat 99: In Boston, Kyrie Irving had 26 points and 10 assists, Al Horford added 16 points and 12 rebounds and Boston beat Miami for its fourth straight victory. Jayson Tatum added 19 points and Marcus Morris 17 for the Celtics, who won their ninth straight at home and improved to 18-5 at TD Garden. Boston led by 19 points entering the final quarter, before Miami rallied and closed within 99-94 with 4 1/2 minutes to play. Warriors 130, Lakers 111: In Los Angeles, Klay Thompson set an NBA record by making his first 10 attempts from 3-point range, scoring 44 points as the Golden State Warriors beat the short-handed Los Angeles Lakers 130-111 on Monday night to match a season high with their eighth consecutive victory. Thompson finished 10 of 11 from beyond the arc as the two-time defending champions won their seventh straight road game. The star guard had 23 points in the third quarter, connecting on seven 3s as the Warriors stretched their lead to 36 points. He finally missed from deep late in the period. 76ers 121, Rockets 93: In Philadelphia, Joel Embiid had 32 points and 14 rebounds to lead Philadelphia past fellow MVP contender James Harden and Houston. Harden, selected Western Conference player of the week on Monday, finished with 37 points – giving him 20 straight games with at least 30. Embiid’s 24 first-half points helped Philadelphia to a 65-50 halftime lead, and he punctuated an entertaining opening 24 minutes by pinning Harden’s layup attempt with 7.5 seconds left for a crowd-pleasing block. The duo had to be separated with 38.7 seconds left in the half, with each being issued a technical, after Harden took exception to Embiid’s foul on him. The 76ers broke the game open in a dominant third quarter as they outscored Houston 29-13 to take a 94-63 advantage into the fourth. Trail Blazers 109, Jazz 104: In Salt Lake City, Damian Lillard scored 26 points and Jusuf Nurkic had 17 in the third quarter to lift Portland over Utah. Nurkic finished with 22 points, nine rebounds, seven assists and six blocks. CJ McCollum added 14 points for Portland, which has won seven of nine. Donovan Mitchell continued his high-scoring streak with 36 points for Utah. Bucks 116, Mavericks 106: In Milwaukee, Giannis Antetokounmpo had 31 points and 15 rebounds, and Milwaukee beat Dallas. Eric Bledsoe had 21 points and Malcolm Brogdon scored 19 for the Bucks, who have won five straight and 12 of their last 14 to improve to 34-12 overall. After trailing at the half, the Bucks built a double-digit lead in the third quarter and led 92-84 heading to the fourth. Pelicans 105, Grizzlies 85: In Memphis, Tennessee, Jrue Holiday and Nikola Mirotic scored 21 points, Jahlil Okafor and Julius Randle had 20, and balanced New Orleans beat Memphis without injured star Anthony Davis. Okafor set a season high for points and added 10 rebounds filling in for Davis. Randle had 12 rebounds and Holiday grabbed 11 as New Orleans outrebounded the Grizzlies 50-35. It was the Pelicans’ first game since announcing Davis would miss 1-2 weeks with a left index finger sprain. Nets 123, Kings 94: In New York, D’Angelo Russell had 31 points and eight assists, and surging Brooklyn won its fourth straight game by running away from Sacramento in the second half. Thunder 127, Knicks 109: In New York, Paul George scored 31 points and Russell Westbrook had 17 points, 10 rebounds and nine assists as Oklahoma City beat New York. George and Westbrook both sat out the fourth quarter. Dennis Schroder added 17 points for the Thunder while both Jerami Grant and Abdel Nader each had 16. Wizards 101, Pistons 87: In Washington, Trevor Ariza scored 20 points, Otto Porter Jr. added 19 and Washington turned in its best defensive performance this season in beating Detroit. The Wizards held the Pistons to 30 percent shooting from the floor in the first half and never let their lead dip below 10 points in the second. Detroit’s 87 points were the fewest by a Washington opponent this season. Seven Wizards players scored in double figures, including Bradley Beal with 16. Magic 122, Hawks 103: In Atlanta, Evan Fournier and Nikola Vucevic scored 29 points apiece to lead Orlando past Atlanta in the season’s first matchup between the Southeast Division rivals. Trae Young had 21 points for the Hawks. John Collins had 14 points and 10 rebounds. Bulls 104, Cavaliers 88: In Cleveland, Zach LaVine scored 25 points and Chicago broke a 10-game losing streak, beating Cleveland in a meeting of teams that began the day with the worst records in the NBA. Chicago never trailed and has won all three games this season against Cleveland, which has lost 16 of 17 overall. Bobby Portis had 15 points while Lauri Markkanen and Kris Dunn each added 13 for the Bulls. Rookie Collin Sexton scored 18 points and Ante Zizic, who is seeing playing time because of injuries in Cleveland’s frontcourt, had 13. Published: Jan. 21, 2019, 10:32 p.m.